Welcome to A Pinteresting Wednesday! Oh wait, it is Thursday. 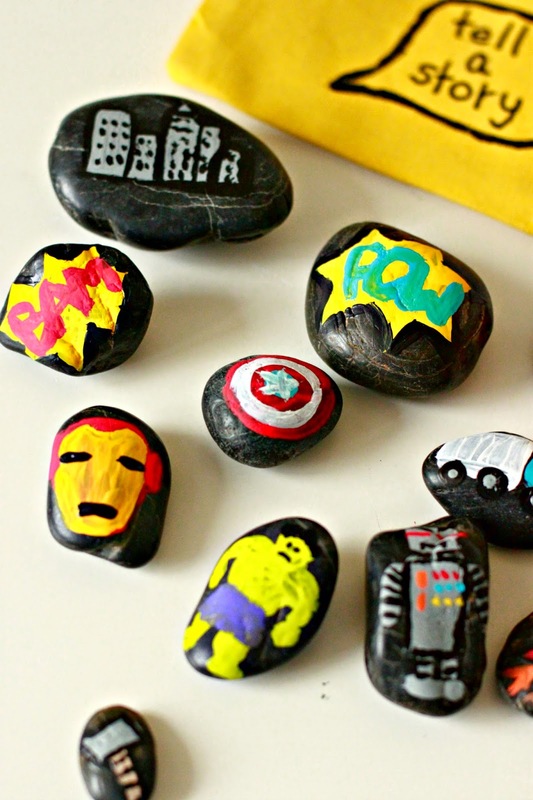 Well I am going to share these Superhero Story Stones with you today for A Pinteresting Wednesday anyway. So let's just pretend for right now that it is still Wednesday and that I blog more than just couple times a month. I have been a little lame lately...well not lame, but just attending to other things. I truly meant to get this all posted and wittily delivered yesterday. But well, I wanted to finish my book. So I did. Hehehe. So now my book is finished. So blogging seems like a good idea. 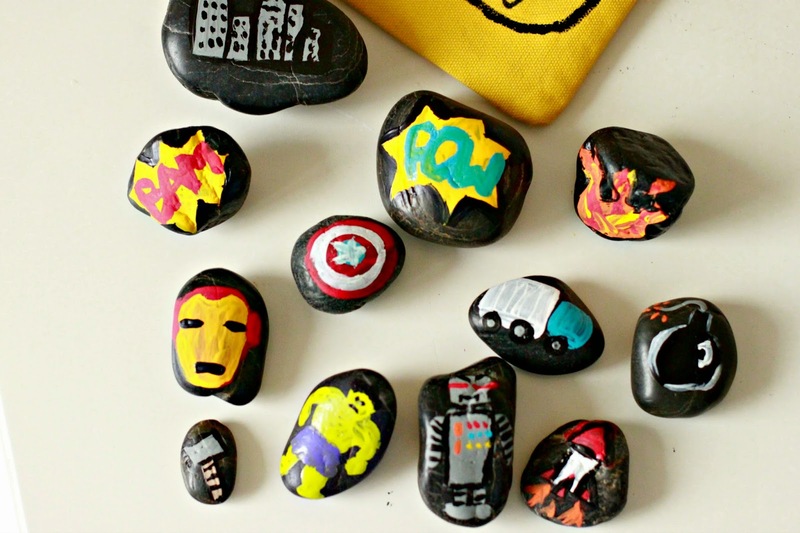 These Superhero Story Stones make me giddy. I had the idea for these story stones on Pinterest. I pinned it to my For the Kiddos board. (The specific ones I pinned are no longer available, in fact I can't even find what store they came from). Little attended a birthday party recently and the birthday boy liked to be creative and liked to read. 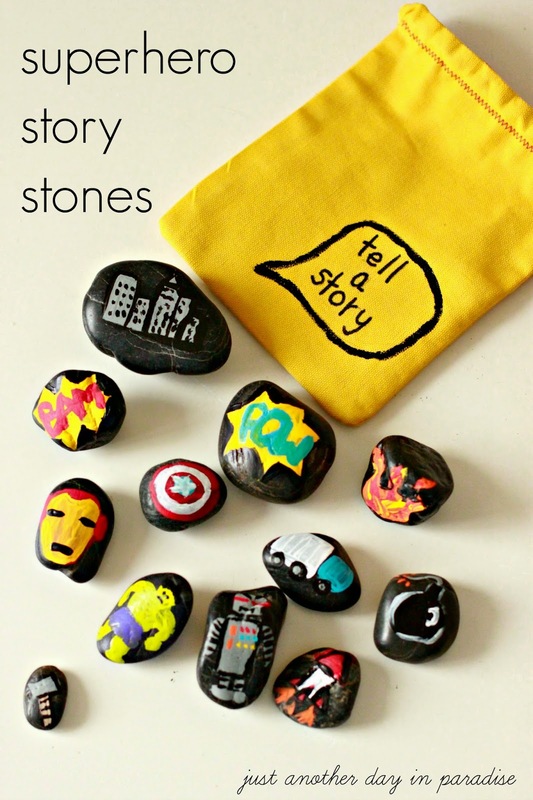 I thought recreating the story stones from my Pinterest board would be a perfect present. I decided to make them even more perfect for a little boy by giving them a superhero theme. That is how these Superhero Story Stones were born. 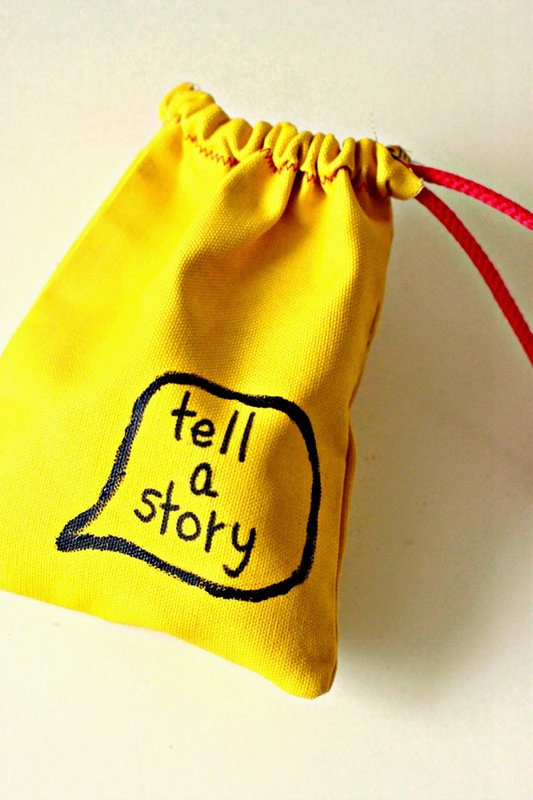 Making your own set of Story Stones is easy. I painted little pictures on the rocks that would coordinate with making up a superhero story. I am not gonna even hide the fact that this was my most favorite part of this project. Could you die over that itty bitty rock Hulk? He is my favorite. 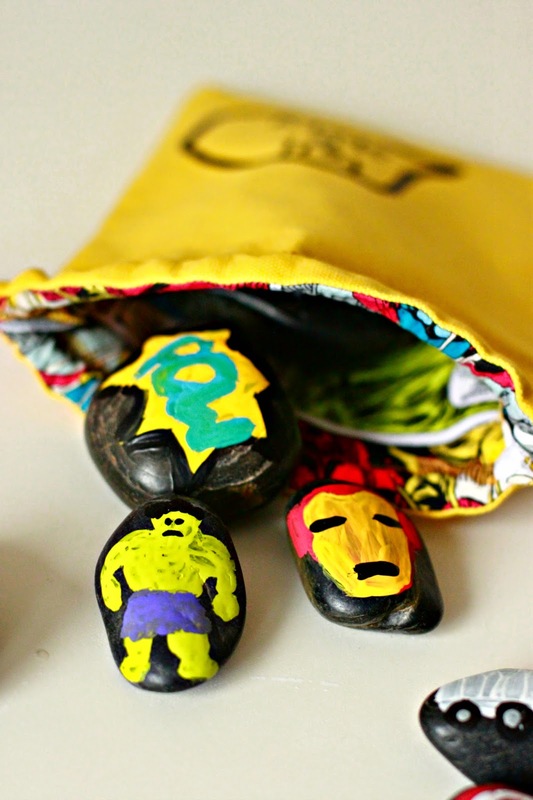 Once I had painted various superhero themed pictures onto the rocks, I whipped up a very simple drawstring bag. I used yellow duck cloth for the outside and a superhero print for the inside. I drew a red cord through as a drawstring. I also hand painted the tell a story word bubble onto the outside. 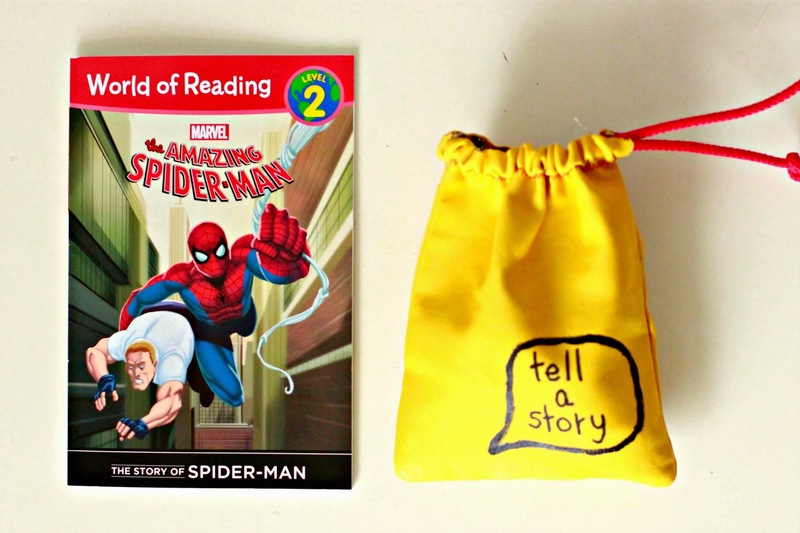 Since our birthday boy liked to read, I also threw in a super hero book to complete the present. My boys are now requesting their own story stones. 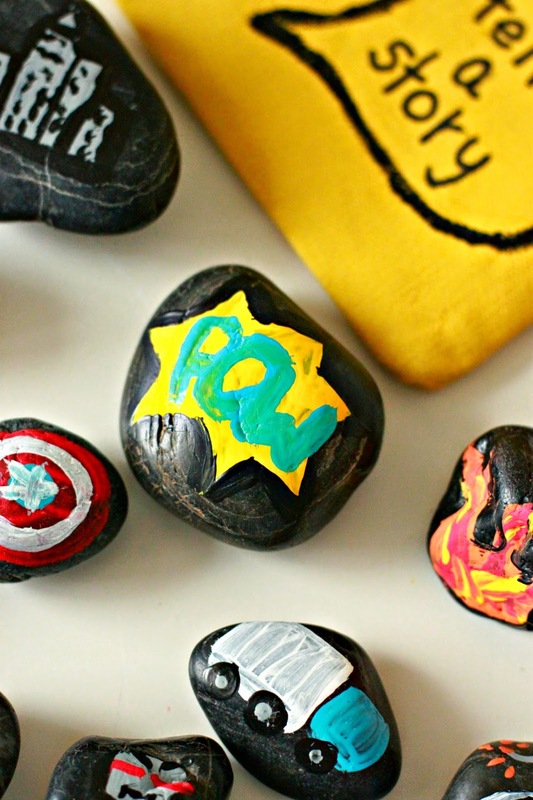 These Superhero Story Stones were such an easy fun gift to make. They are also so easy to fit any theme. Man the possibilities are endless--princess, animals, cars, farm, ocean, robots, Frozen...I could go on and on.